When it comes to drawing a map of a place, Wake Island is about as easy as it gets. The small Pacific atoll is small, distinctive in shape, and practically begs the casual observer to try his hand at cartography. The familiar outline of Wake atoll has been variously described as a wishbone, horseshoe, or simply V-shaped, with the three islets – Peale, Wake proper, and Wilkes – flanking a shallow lagoon that opens wide to the west. During my research for Building for War I was drawn to the many maps of Wake that I encountered from hand-drawn sketches in letters to professional renderings in archives to modern maps. The subject is the same but each map is unique. They are like snapshots in time, showing Wake in its historical context and the perspective of the mapmaker. Early in my research I was delighted to find maps drawn in letters sent home during the year before the war. 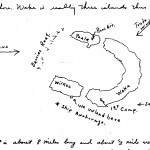 On December 23, 1940, three days before departing for Wake with the pioneer party (and, coincidentally, exactly one year before Wake fell to the Japanese), my grandfather wrote a letter to his daughter Donna, describing the dangerous unloading conditions ahead when they reached Wake and he drew a simple sketch of the atoll. Harry Olson, in charge of the unloading operation, was focused on the one notch on the south shore where they would have to bring in the barges of valuable equipment – waves, wind, and good luck permitting. Carpenter Peter Hansen arrived on Wake in the spring of 1941 and settled in to the tent camp on the southwest arm of Wake. He wrote frequently to his wife and family in California and often included sketches of his observations. (I am grateful to Mary Anne Collins for sharing her late father’s letters and family documents for my book.) Unfortunately, none of his drawings made the cut for the book. I included a couple of his sketches in my earlier post “Draw It, 1941” but his map of Wake is my favorite. 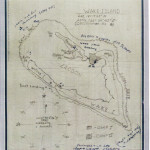 Drawn in late March 1941, Hansen’s map focuses on Camp 1 and the waterfront where the main activity was at that time. The carpenters had just begun work on the first structures in Camp 2 on northwest Wake, connected by a slender road through thick brush. 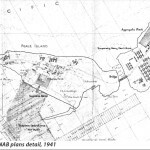 When surveyor Joe McDonald took pencil to paper in late August, his map showed a more detailed physical outline of the atoll and surrounding reef. Thanks to his son, Joe, I was able to include excerpts from his many letters from Wake in my book. 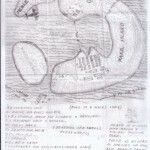 McDonald’s attention to accurate perspective and coordinates on Wake reflects his trade, just as his peripheral comments reflect his dry sense of humor: “McDonald & Co. LTD Map & Chart Makers (Maps for All Occasions),” and “Shark and Eel Territory (STAY OUT)” on the western reef. We can see the layout of Camp 2 on the northwest end of Wake, by now fully occupied by the contractors, and the new bridge linking Wake to Peale as evidence of construction progress. Several important maps are included in the front matter map section of Building for War. One of these is the 1935 map drawn by U.S. Navy Lt. C. W. Porter during his secret survey in conjunction with the initial Pan American Airways trip to Wake. 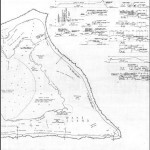 This map shows Wake prior to any human development (save the ruins of an old Japanese fishing camp) with detailed descriptions of strata and flora. A second map, drawn by CPNAB engineers and dated December 1, 1941, shows the civilian contractors’ progress to date on Wake just before war broke out. I vividly remember my first sight of these maps: I found the original 1935 map, several feet square, in the National Archives, Pacific Region in San Bruno California, and pored over it for hours, imagining Wake in its native state. The December 1941 map was a blueprint drawing that I discovered in the Morrison-Knudsen Co. records stored in a cavernous warehouse in Boise Idaho. This box of records had likely not been touched for decades. As I carefully unfolded this original map (the creases are still evident in the shadows on the map copy in my book), the date leaped out at me: this was Wake Island on the very eve of the war for which they were preparing, but no one knew how close it was. Many postwar Wake accounts use or adapt the excellent map created for the USMC monograph, “The Defense of Wake,” by Robert D. Heinl in 1947. 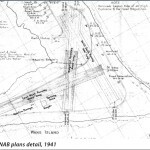 With my focus on the civilian contractors and in order to accurately describe their Wake Island, I commissioned outline maps, expertly constructed by Bill Cameron of Portland Oregon, and enjoyed working with him to include the aspects of Wake that I discussed in the book. I have encountered, scanned, photographed, and collected many maps of Wake over the last several years and continue to seek and find pieces of the historical puzzle. Maps provide fascinating windows on a place and time – and often on the mapmaker himself.